Within the IQF potato industry steam peeling is the most common and efficient way of peeling. It is easy to obtain better yields compared with cold peeling systems, which are preferred within the fresh potato industry for a better end quality. However, this doesn’t mean that perfect quality can’t be achieved within the IQF industry. Today it has become more and more standard to use an optical sorter after steam peeling potatoes. The sorter will sort out all the defects. Afterwards the rejected potatoes can be re-directed towards different process (eg flake lines, waste, etc). 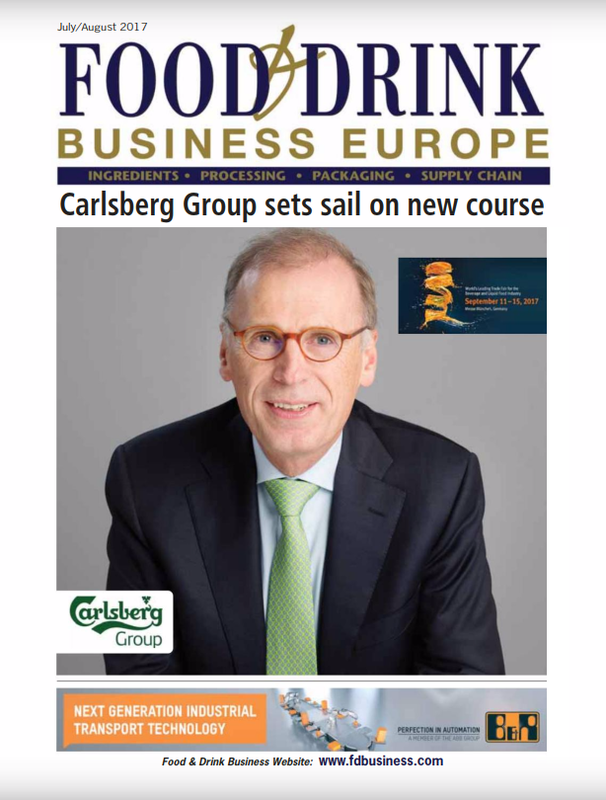 At Finis, the Netherlands-based food processing equipment specialist, a development team has been working on a different solution for many years. A few solutions for re peeling the steam peeled potatoes have been successfully installed through the years but now there is a new and better version destined to make a difference. Although a little thing to implement, it will make a big difference to quality and efficiency. 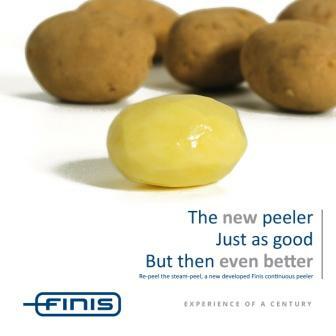 The continuous re peeler from Finis makes a difference on multiple fronts. Because the quality of the raw product keeps changing within the seasons and within different suppliers it is proven to be more efficient to reduce the steam usage and peeling time while peeling. This will create less waste on the potatoes but it will also increase the amount of defect potatoes. In combination with the optical sorter only the defect potatoes will be rejected and briefly re-peeled by the Finis re peeler. Even more difficult types of potatoes can be processed. The result is a reduced amount of steam usage which means savings on energy costs. Thanks to the peeling efficiency a small saving on raw material can also be obtained. With the prices of raw material going up and down, this means that a small saving can become a very big one. Besides the advantages of savings on energy and raw material, Finis made sure to develop a system that is easy and quick to clean, with minimum to no maintenance, and has the lowest possible running costs so that processing clients can benefit from less costs instead of extra. The new Finis peeler can be installed with an extra smart control system, which can be connected to any kind of optical sorter. By connecting these systems it becomes possible to automatically adjust the parameters of the peeler. 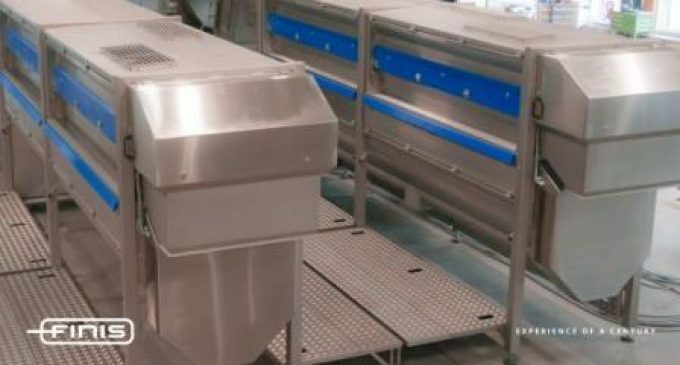 Depending on the changing quality of the raw product, the optical sorter can advise the peeler to run slower or faster which increases the efficiency overall. Furthermore efficiency data can be obtained automatically by weighing the infeed and outfeed. The most exclusive version of the system can give signals back to the steam peeler to advise if the parameters of the steam peeler need to be adjusted. 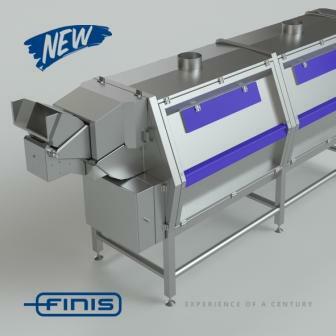 Besides processing the defects after a steam peeler, many processors choose to run the full production through the Finis peeler. The main reason is to remove the outer cooking edge for an even higher end quality. Finis has succeeded in making the machine even more versatile. Processors can also choose to use it as a machine that is very suitable to peel potatoes for the fresh market. All this with the highest quality and efficiency, while keeping the same advantages. The Finis peeler has been successful in making a significant difference for many years in world leading processing companies. 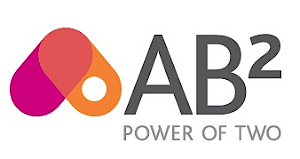 This new model will make it even easier to make that difference.